In January 2012, Wizards of the Coast announced that it was working on the next version of Dungeons & Dragons and that it would take two years’ worth of development time. So whilst the hobby waited to see what D&D Next or ‘Dungeons & Dragons, Fifth Edition’ would look like, it left a gap at the top of the hobby because for intents and purposes, the game, in the form of Dungeons & Dragons, Fourth Edition, was redundant. This is not to say that the style of play that Dungeons & Dragons offered went away. After all, PaizoPublishing’s Pathfinder Roleplaying Game was and continues to be popular, and there are of course any number of ‘Retroclones’ that Dungeons & Dragons style play based on older variants of the rules, most notably Labyrinth Lord and Lamentations of the Flame Princess Weird Fantasy Roleplaying. More recently Pelgrane Press has given the style of play a contemporary update with 13th Age. In 2012 the update to this style of play was offered by Goodman Games in the form of the Dungeon Crawl Classics Role Playing Game, an ‘Old School’ style nod to the literary sources for the original Dungeons & Dragons. By 2012, Goodman Games was no stranger to the ‘Old School’ style, having published in nine years some fifty or so titles for its Dungeon Crawl Classics line, starting in 2003 with Dungeon Crawl Classics #1: Idylls of the Rat King. What each entry in the series provided was a scenario in the classic sense, as published by TSR in the first ten years of its history, scenarios in which the adventures itself mattered more than the setting and the NPCs were primarily there for the slaughter than the scintillating socialisation. Yet by 2012, the series had stalled, its quality suffering primarily from a new rules system that seemed ill-suited to its intended style, but then by 2012, critics had long been wondering what type of game Dungeons & Dragons, Fourth Edition was suited to. 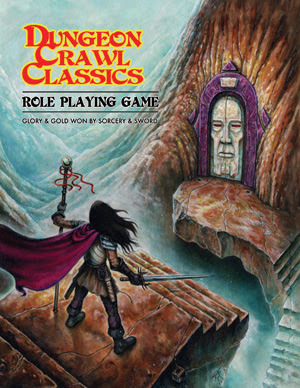 The Dungeon Crawl Classics Role Playing Game offered a chance to reinvigorate the line and the concept. The resulting game was and is not a ‘Retroclone’ in the classic sense – one that sets out to emulate a particular set of rules; it is instead a d20 System RPG that goes back to the inspirational source for the original Dungeons & Dragons – the legendary ‘Appendix N’. Penned by Gary Gygax as part of the Dungeon Master’s Guide for Advanced Dungeons & Dragons, First Edition, ‘Appendix N’ was a list of Science Fiction, Fantasy, and Horror authors that inspired the innumerable elements that made up Dungeons & Dragons, whether it was Fritz Leiber’s thieves or Jack Vance’s magic and spells, or Robert E. Howard’s corruptive influence of magic. From this basis, author Joseph Goodman has developed an RPG that uses the same basis for its rules as the d20 System, but one that sits somewhere between Basic Dungeons & Dragons and Advanced Dungeons & Dragons in terms of its complexity. To get into what the Dungeon Crawl Classics Role Playing Game is about, you need to start at the beginning and in the Dungeon Crawl Classics Role Playing Game, that means playing Zero Level characters. Playing characters of Zero Level in Dungeons & Dragons is nothing new. It was done by TSR in 1986 with N1, Treasure Hunt and then again in 1987 with N5, Under Ilefarn, and then in 2005 by Goodman Games in Dungeon Crawl Classics #0: Legends are Made, not Born. Here each player takes the role of not one Zero Level character, but several, each a serf or peasant looking beyond a life tied to the fields and the seasons or the forge and the hammer, looking to prove themselves and perhaps progress enough to become a skilled adventurer and eventually make a name for themselves. Unfortunately, delving into tombs and the lairs of both men and beasts is a risky venture and death is all but a certainty for the lone delver… In numbers, there is the chance that one or more will survive long enough to go onto greater things! This is what the Dungeon Crawl Classics Role Playing Game terms a ‘Character Creation Funnel’. Characters in the Dungeon Crawl Classics Role Playing Game, just like in Dungeons & Dragons, have six Abilities – Strength, Agility, Stamina, Personality, Intelligence, and Luck, each rolled on three six-sided dice. These are rolled in strict order, because after all, life in the world of the ‘Known Realms’ or Aéreth, that of the Dungeon Crawl Classics Role Playing Game, is something of a lottery. That includes not just his basic Hit Points – rolled on a single four-sided die, but also the Zero Level character’s occupation, which will also determine his race, a weapon, and a possession related to his occupation. For example, this could be a cheesemaker with his cudgel and stinky cheese or an animal trainer with his club and pony, but it could be an Elven navigator with his bow and spyglass or a Dwarven chest-maker with his chisel and his 10 lbs. weight of wood. For in the Dungeon Crawl Classics Role Playing Game, just as in the original Dungeons & Dragons and Basic Dungeons & Dragons, the races Dwarves, Elves, and Halflings are Classes as much as they are species. Of the six core Abilities, Luck is the one that needs the most explanation. It is used for various different skill checks and rolls, for each character’s single Luck Benefit – for example, in the case of Milo, to find Secret Doors – and can even be burned to gain a one-off bonus. The latter though is a permanent use and any Luck lost in this fashion can only be regained by a player roleplaying his character to his Alignment. The Luck bonus also applies to critical hit, fumble, and corruption rolls as well as various Class-based rolls. For example, the Elf receives it as a bonus one single spell and a Warrior to a single weapon such as a longsword or a war hammer. Further, both the Thief and the Halfling Classes are exceptionally lucky. Not only are their Luck bonuses doubled when they burn Luck, they actually regain Luck each day equal to their Level. In addition, if a party has a Halfling amongst its numbers that Halfling can pass his expended Luck to other members of the party! So once a Zero Level has been on an adventure or three and acquired enough Experience Points, he can advance to First Level. It only takes ten Experience Points, with an average of two points being awarded per encounter, rather than per monster killed or item of treasure being looted. It should also be pointed out that the Experience Points progression needed to reach Second and subsequent Levels has been substantially streamlined and simplified for ease of play. Human characters can advance from Zero Level into one of the four Classes – Cleric, Thief, Warrior, and Wizard, whilst the demi-humans advance into the Class appropriate to the Occupation rolled during character creation, the Elf Class for Elves, the Dwarf Class for Dwarves, and the Halfling Class for Halflings. Each Class feels very much the Classic version seen in, for example, Basic Dungeons & Dragons, but with sufficient tweaks that make each – and thus the Dungeon Crawl Classics Role Playing Game – more interesting to play than those of Basic Dungeons & Dragons. The Cleric must choose a god and matching Alignment and weapons training – which includes the Neutral deity Cthulhu if the player wants his character to be a Priest of the Old Ones! – and in return gains clerical or Idol Magic, can Turn creatures unholy to his god, and can Lay on Hands. The latter includes the ability to heal broken limbs, organ damage, disease, poison, and more – rather just heal Hit Points. It is possible for a Cleric to gain the disapproval of his god and even sin, this including the healing of a character of an opposing Alignment or faith. Thieves are relatively little changed, although their skills – Backstab, Sneak Silently, Hide in Shadows, and so on – are done as a bonus to the RPG’s universal d20 System skills mechanic rather than as percentiles. The skill values and their progression also vary depending upon whether the Thief is Lawful, Neutral, or Chaotic. The Warrior receives one single new ability, that of being able to undertake ‘Mighty Deeds of Arms’. Need to sweep an opponent off the stairs or swing on a chandelier to kick a mob down or throw a flask of flaming oil into the eyes of a basilisk? With the simplicity of the Mighty Deed of Arms mechanic, a Warrior can. Wizards of course cast magic spells, but their initial spells are randomly known and they also are encouraged to take a patron, like Bobugbublilz, demon lord of amphibians or Sezrekan the Elder, the wickedest of sorcerers, whom they can also invoke to gain powerful, but dangerous magic. The Dwarf is like the Warrior and can match that Class’ Mighty Deed of Arms, but in addition gains a random bonus to each attack and do a bash attack with his shield. The Elf is susceptible to iron and so must use mithril arms and armour, and can use many martial weapons as well as cast spells, but must work closely with an extra planar patron to do so. Lastly, the Halfling, as well as being intrinsically lucky, is also stealthy and capable of using two weapons together in a fight. There are lots of elements in these takes upon the classic character Classes that add both a mechanical benefit and flavour. The addition of the Mighty Deed of Arms not only gives the Warrior an edge, but also gives the player room to develop his character’s style of play and match it to his weaponry; the Cleric gets to both role-play and ‘roll-play’ his faith; and in both cases, the Dwarf and Halfling Classes are far more capable than the classic versions of either Class. In addition, each of the Human Classes, bar the Wizard since the pursuit of magic is a solitary affair, are each given a pair of pages devoted to suggested backgrounds and organisations for those Classes that add further flavour. To undertake an action, a player rolls an Action Die and adds to the result any of his character’s Attribute bonuses, Luck bonus, and Level bonuses that apply. This is usually against the base Difficulty Class of ten, with difficulties raising or falling by five. This also applies to Spell Checks for Clerics, Wizards, and Elves, and also to combat, although the target in combat in the Dungeon Crawl Classics Role Playing Game is an ascending Armour Class. In most cases, the Action Die is a twenty-sided die, but this can change. For example, as a gypsy, Milo might have a way with ponies that allows him to make a skill check using a twenty-sided die as his Action Die to determine the health and value of any pony that he wants to purchase. Were he to attempt to illuminate a forged manuscript, he would only roll a ten-sided die as his Action Die – and that is in addition to the penalties he would suffer to the roll for his lack of skill! Where Dungeons & Dragons and other games of its ilk use the usual polyhedral panoply – the four, the six, the eight, the ten, the twelve, and the twenty-sided die, the Dungeon Crawl Classics Role Playing Game employs another seven in addition to those standard six. These are the three, the five, the seven, the fourteen, the sixteen, the twenty-four, and the thirty-sided dice. These are arranged in a ladder or ‘dice-chain’ that goes up from the twenty-sided die to the twenty-four-sided die and then to the thirty-sided, and down from the twenty-sided die to the sixteen-sided die and then to the fourteen-sided die and so on. Different Action Dice are rolled when a Warrior or Dwarf makes his second attack which he gains at Fifth Level and also when a Dwarf rolls his Attack Bonus. Suggestions are given if the Judge and his players lack these different sided dice. If the Judge does want them, they are only available from Gamescience. None of these are inexpensive dice and that is just ordering them within the United States. International orders are another matter… This is an issue with the Dungeon Crawl Classics Role Playing Game, but how much of an issue will vary between one Judge and his players and another Judge and his players. Combat in the Dungeon Crawl Classics Role Playing Game is relatively little different to that of d20 System. Bar the use of a second Action Die type to grant certain Classes second actions in combat – the Warrior and the Dwarf gain a second attack and the Wizard and the Elf gain a second spell to cast at higher levels, the extra combat rules add rules for Fumbles, Critical Hits, and expanded details for Mighty Deeds of Arms. In each case these are accompanied by tables and charts, which in the case of Critical Hits is varies according to a character’s Class and Level, so there are several of them. Magic in the Dungeon Crawl Classics Role Playing Game is no longer a matter of casting a spell and forgetting about it. Instead magic is deadly and dangerous, sometimes corrupting, but it can be very powerful. A Wizard can enter duels with enemy Wizards and Clerics to counterspell their spells and a Wizard can also Spellburn points in his Abilities to gain temporary bonuses to regain lost spells. This is only temporary – rest and recuperation will let the Wizard regain these Ability points. Spell duels increase the capabilities of both Classes, although the rules do add a degree of complexity and time consumption not readily found in the rest of the game. Within the game itself, there is the danger of the spells perfectly countering each other and setting up a ‘Phlogiston Disturbance’ that might cause the spells to merge, the summoning of supernatural creatures, or set up a backward time loop! In addition, whenever a Wizard learns a spell, he learns it in a slightly different way to any other Wizard and that means that the spell has a slightly different extra effect that varies from one Wizard to another. This mercurial nature means that when the Wizard casts one spell, he might suffer the Sleep of Ages, whilst with another he might gain a temporary Psychic Shield. A Wizard’s Luck bonus applies to the roll to determine this effect whenever he gains a new spell. Rather than listing magic item after magic item, the Dungeon Crawl Classics Role Playing Game presents both a discussion of their nature in the ‘Known Realms’ and the means for the Judge to create them. Magic items in the Dungeon Crawl Classics Role Playing Game are rare and of a singular nature and purpose. They may even be of such power as to arouse the ire of a demi-god! In keeping with the sources within ‘Appendix N’, the creation of swords receives particular attention, whilst guidelines are also given for the creation of wands, rods, rings, and other items. The mixing of potions is covered by the Make Potion spell. Monsters are treated in a not too dissimilar fashion. Although standard versions of each are included, from the Basilisk and Bugbear to the Wolf and the Zombie, there are rules and suggestions as to how to make them mysterious, if not necessarily unique, essentially to spice them up a little, and so ensure that they are not simply generic. The monsters have access to broad set of their own Critical Hits table to roll on when fighting against the player characters. The last fifty or so pages are devoted to a series of appendices that cover everything from languages and poisons to names and the fabled ‘Appendix N’, as well as two short scenarios. ‘The Portal Under the Stars’ is designed for Zero and First Level characters and sees them enter a supernatural portal and delve into the burial tomb of an ancient war-wizard. It is followed by ‘The Infernal Crucible of Sezrekan the Mad’, an adventure for Fifth Level characters in which the experienced player characters enter one of the workshops of the notorious sage, diabolist, and warlock, Sezrekan, who was obsessed with attaining immortality. Both scenarios are relatively short if deadly affairs that that are accorded plenty of detail and flavour. They also previously appeared in the DCC RPG Free RPG Day Adventure Starter released for Free RPG Day 2011 and reviewed here. In addition, certain editions of the game have a copy of Dungeon Crawl Classics #66.5: Doom of the Savage Kings inserted inside the front cover. Designed for First Level characters, this has them visit the village of Hirot which of late has become besieged an immortal hound, a devil-beast that hunts the inhabitants of the settlement. It can be played by Zero Level characters, but will be even deadlier than the ‘The Portal Under the Stars’. Unlike ‘The Portal Under the Stars’ and ‘The Infernal Crucible of Sezrekan the Mad’, Doom of the Savage Kings is much more of a full scenario than a simple dungeon delve and serves as a good adventure for First Level characters and the Judge new to the Dungeon Crawl Classics Role Playing Game. Physically, the Dungeon Crawl Classics Role Playing Game, despite being almost five hundred pages long, is surprisingly light in the hand. A wholly black and white hardback, what strikes the reader about the volume is that it is profusely illustrated, not quite one illustration per page, but certainly not far off. Every one of these illustrations is drawn by artists familiar to the Old School Renaissance – Jeff Dee, Jeff Easely, Jim Holloway, Erol Otus, Jim Roslof, and more. Many of the pieces delightfully illustrate the text and all of them invoke not just the Old School style, but also the look of the core three books of Advanced Dungeons & Dragons – the Monster Manual, the Player’s Handbook, and the Dungeon Master’s Guide; the latter in particular with its little cartoons that dig at the mores of Dungeons & Dragons. In addition, the cartography for all three adventures is excellent. On the downside, the book lacks an index and that is inexcusable in this century and age, especially given how often a Judge needs to refer to the contents of the book. The Dungeon Crawl Classics Role Playing Game is not a complex game by any means, but it makes heavy use of charts – and often, especially if one of the player characters is a Cleric, an Elf, or a Wizard when every casting of a spell requires the consultation of a particular chart. This is more an issue than the need to purchase special dice in order to get the most out of the Dungeon Crawl Classics Role Playing Game, but there are ways around this whereas there are no means given to play the game without the charts. Nor though, would you want to. The charts and the tables are fundamental to handling both the high and the low points of combat and both the high and the low points of casting spells. Nor are the charts just mechanically important, as they add both flavour and feel aplenty to the game’s play. Whilst the Dungeon Crawl Classics Role Playing Game is not an Old School Retroclone per se, it is a love letter to the Old School. This shows in the choice of artists, the use of the fundamentals of Dungeons & Dragons’ architecture – the character Classes, the spells, and so on, and in what by modern standards is an imbalance between one character and another. This imbalance can be as simple as better core Abilities for one character and not another, but it also shows up in the differences between the Classes. For example, the Warrior is a consistently powerful Class with its Mighty Deed of Arms capability, whereas the spell casting Classes are powerful, there are also debilitating constraints to the use of magic, whether it is the chance of mishaps and Corruption for the Wizard or the possibility of disapproval by his deity for the Cleric. That said, when roleplayed, these are entertaining aspects of the Dungeon Crawl Classics Role Playing Game. As the first major publisher to delve into the Old School Renaissance with the Dungeon Crawl Classics line, Goodman Games was best placed to publish a roleplaying game like the Dungeon Crawl Classics Role Playing Game. There is no doubting that it would have been easy for Goodman Games to publish just another Retroclone, but in the Dungeon Crawl Classics Role Playing Game, Goodman Games did something different. It designed and published an Old School style RPG that draws on the same sources as Dungeons & Dragons, but yet stands on its own mechanically, thematically, and tonally. As much as there is the familiarity of both Dungeons & Dragons and the d20 System to the Dungeon Crawl Classics Role Playing Game, the differences in terms of its mechanics, its themes, and its tone all serve to give the Dungeon Crawl Classics Role Playing Game an engagingly brutal charm.